This excellent re-issue is a perfect time capsule that captures Hawaii's self-styled "Lady of Love" as she was in 1977. Now, as then, its strengths outweigh its weaknesses. Even the lesser choices, the disco-beat title track and "You are the Sun, Hawai'i" for example, display her power and range as a distinctive stylist. Garner was a piano bar artist before she became a showroom attraction, and her talent as a pianist is evident as well. The weaknesses are largely reflective of the showroom standards of the era. There's the unfortunate use of tinny synthesizer tracks as sonic filler -- a cost-cutting expedient embraced by many artists. The disco beat tourist-show rhythms of the title song have also not aged well. The arrangement of "City Lights," a song Garner wrote about one of her favorite places outside urban Honolulu, also has the distinct local pop sound of the time, but musicians play it well and the sentiments are sincere and heartfelt. Overall, these vintage recordings are a fine memento of a popular local star. Garner's rendition of "Hawai'i Aloha," the patriotic hymn that sets Lorenzo Lyons' lyrics to a melody by James McGranahan, still sets a high standard. Her "Iesu Me Ke Kanaka Waiwai"/"Just a Closer Walk with Thee" medley reaffirms her command of soulful Christian music. Garner was also well known for including narrative passages in her recordings. She did so here with "Hanalei Moon" and "Maui Waltz," and also shared a variant translation of "Morning Dew" in speaking of her "sighs of love as I share this precious moment with you" and describing the sunlight as it "... glistens profusely against my cheeks." Hula Records president Donald P. "Flip" McDiarmid III and project coordinator Cindy Lance cut no corners in giving Garner, these vintage recordings and her loyal fans the respect they deserve. 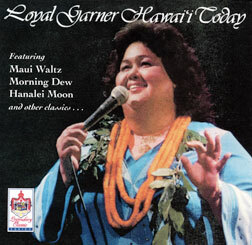 Jean Sullivan's original liner notes are included, with lyrics and English translations for the Hawaiian songs, but there is additional annotation that provides an overview of Garner's many accomplishments in the years after this album was released. Garner died in 2001 at age 55. This album is a perfect introduction to her unique musical legacy. Lehua Records was a major presence in the local record industry in the 1970s, but most of its re-issues have been low-budget products that lack any updating of the packaging or annotation. Anyone who buys Hawaiian albums deserves more than that, and if this anthology is representative, the label's current trustees may finally be coming around to that viewpoint. 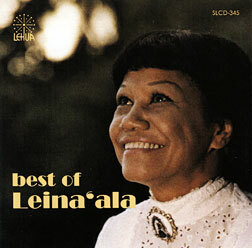 The liner notes for this 14-song Leina'ala Haili anthology actually mention that the famed Hawaiian falsetto singer died in 2005, and reveal that 10 of these recordings are being made available on CD for the first time. Documentation of Hawaiian recordings is essential if cultural knowledge is to be shared and perpetuated, and although no information is included about the individual meaning or significance of the songs, the beauty of Haili's falsetto singing and the clean acoustic arrangements make this "Best of ..." retrospective welcome anyway. And, although this might be expected when an anthology of 14 songs is assembled from 66, from first to last almost all of them are beautiful. Haili's subtle but effective use of ha'i, the uniquely Hawaiian technique used by falsetto singers of both genders to emphasize the transition between lower and upper vocal registers, made her one of the great female Hawaiian falsetto singers of the last century. The proof is found in her beautiful renditions of "Pohai Kealoha," "My Tropical Baby" and "Maile Swing" -- and those are only three of the gems now available for a new generation of Hawaiian music fans.